The latest and greatest from the Big Joe collection, this 2-in-1 bench ottoman in zebra print is sure to become your next favorite seat in the house! At almost three feet long, this bench is ready to hold two comfortably and can even seat three small children. Doubling as an ottoman, the low height makes it ideal to pair with any Big Joe bean bag chair as a footrest. 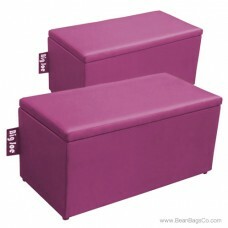 Like all Big Joe bean bag products, this bench ottoman is sturdily constructed of SmartMax fabric that is beautiful, comfortable, durable and resistant to wear and tear. Not only does the fabric hold up well to use, it can be easily spot-cleaned with a damp cloth to keep it looking great. The UltimaX bead filler conforms to your shape and holds you up ergonomically, guaranteeing comfortable and relaxing seating. 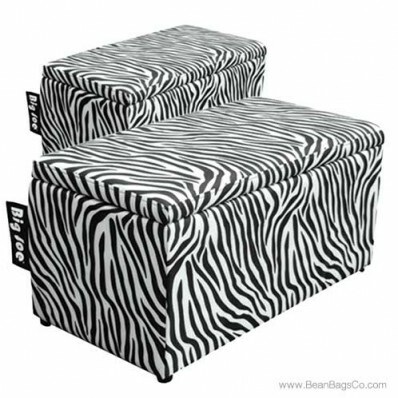 Add this vibrant zebra-print bench ottoman to your casual furniture collection and see all the ways you will find to use it for seating and relaxing!